I just returned from a very pleasant week-long trip to the island of Islay in Scotland, organized by the Wildlife Sound Recording Society. I have previously attended many WSRS meetings (blog posts here, here and here) and I knew I wouldn't be disappointed, so on Saturday morning I joined Richard Youell as we (read: he) drove up from Cambridge to Kennacraig. The 500+ miles and ferry to Islay took us more than 14 hours, but the week ahead was well worth it. It did not initially seem so though. The forecast looked great a week earlier, but as soon as we got there the rain and wind started. The first few days were dedicated to photography and exploring the island, since it wasn't possible to record anything. This wasn't all that bad, but at one point we started to feel guilty about not doing any proper recording. A few visits to the 8 whisky distilleries on the island definitely helped. I normally do my homework before going on such a trip, but I had just returned from my expedition to Romania (blog posts following soon) and I had to catch up on studio work. Luckily, Richard and Bronwen (with whom I had the pleasure of sharing a cottage) had done extensive research and knew all the interesting spots on the island. They even brought Ordnance Survey maps, which coupled with a GPS watch helped us find everything. On Tuesday the weather finally cleared up and we got to do some recording. My first target was a colony of corvids made up of mainly rooks and jackdaws. This was quite close to an RSPB wetland reserve and a few farms, but the corvids were making a lot of noise (as they do) so I was hoping to get at least a few clean bits in an overnight recording. After a few hours of morning sleep and a hearty brunch at Kilchoman Distillery we were ready to go exploring and recording some more. We decided to visit the famed Islay Blowhole. I packed my SD 633, Mixpre 10T and 6 DPA lavs, planning to do a multi-channel recording of said blowhole. After half an hour of driving and half an hour of hiking up and down -hill, we finally got there only to realize I had forgotten to bring my DPA XLR adapters. I was quite bummed out as Richard was setting up to record using his Schoeps MS rig. I guess the lack of sleep and extensive physical activity made it easier for me to make mistakes. After a few minutes of listening to the otherwise awesome-sounding waves crashing underneath me, I realized I had brought my backpack, and along with it my trusty D100! All was not lost, so I proceeded to recording the blowhole from several perspectives. I still wasn't happy though, and since the place sounded so good we decided to come back the following day. Knowing more about the geography of the place this time, I brought my DMS rig and a Manfrotto Nanopole lighting tripod. The latter is an excellent tripod for field recording, and as a bonus also folds down inwardly. This made it possible for me to hang my DMS rig upside down into the actual hole and to record it in surround. I first screwed each segment of the tripod tightly and dropped it in. I tried holding it in place in case it lost purchase on the rocks, but a swarm of fierce midges got the better of me. After 10 minutes or so I was forced to leave the rig by itself and to run away flailing my arms, now covered in numerous midge bites. Luckily the Nanopole did a brilliant job and kept my Cinela blimp (with the DMS rig inside it) from falling to its certain doom. After about an hour of blowhole recordings from different perspectives, we headed back to the cottage so we could prepare for the overnight recording. This time we went to a dense coniferous forest in a sheltered spot on the island which promised good dusk and dawn choruses. Most of the overnight recording sounds good and atmospheric, with distant deer barks, owl cries, panicked pheasant calls and soft ambience. I will include some of these recordings in a further update for Eerie Forest, which by the way has seen excellend feedback so far. 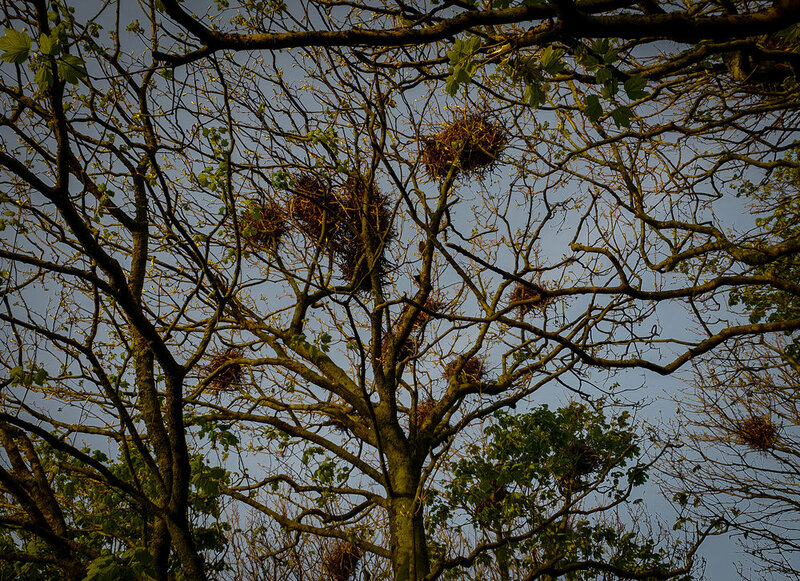 For Thursday's overnight we went back to the rookery, but this time we went further into the woodland and found a different location with more nests spread over a wider area. It doesn't sound quite as present as the first night's recordings did, but it's an interesting and more immersive perspective. I'm considering putting these recordings together into one library but I will have to get through all the backlog first. On Friday we decided to take it easy. All the hiking and lack of sleep finally caught up with us, and on top of that the wind had picked up again. We went for a few hikes, discovered more interesting places for recording (too late sadly) and did another sunset photo session at 10pm. It was a great way to wrap up a very enjoyable week. There were plenty of choughs and some corncrakes around, but I didn't get to record either. I had some good recordings of corncrakes from my trip to Romania, and the choughs only seemed to call when it was windy. We also spotted a Great Northern Diver and a couple of White Tailed Eagles, but sadly no Otters! As always there are things I could have done better. I should have purchased maps and done my research before I left. I should have explored the areas around the cottage better right after arriving on the island. I should have recorded more open spaces like meadows and fields, even if there were sheep and cattle everywhere. All these are good points to remember next time I'm on a Scottish island, which might happen sooner rather than later. The company was an excellent mix of sound recordists, birders, sound artists and photographers. Everyone was incredibly generous sharing their knowledge and experiences, as it seems to be the case at the WSRS meetings. Food and whisky were great, obviously. Going back into the routine of recording overnight and listening to recordings at breakfast was really enjoyable. All this makes me look forward to the next time I join the Society on one of the trips.